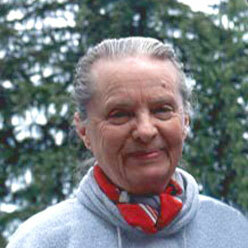 Every Once In A While a poet comes to popular attention with a book that leaves us wondering, “Why haven’t I discovered this one before?” Marie Ponsot is such a poet; The Bird Catcher, winner of the 1998 National Book Critics Circle Prize for Poetry, the Delmore Schwartz Prize, and finalist for the Lenore Marshall Prize, is such a book. Although most of her poems are composed in traditional forms, Ponsot does not make a poem like a bricklayer lays bricks; she is, rather, more like a master stone mason, choosing, trying the fit, choosing again, and finding always the precisely correct stone before adding mortar, making something at once tight, structured, and yet surprising to both maker and audience. She could almost be describing this process in “A Determined Present:” “Chance as it maps/ the next necessity/ steps her, step by step,/ as if she is free.” Perhaps it is “chance,” but only because she has put herself in the way of chance, bringing with her an unerring eye and ear, a feel for the physical presence of words in the mouth, and a fierce willingness to confront the occasions for poetry. Northampton-style, on the porch out back. that lets us wash out mix of dreams together. its voice touches and parts the air of summer. I am not with him. Redress calls for tact. though the players keeps up his plangent attack. This is not simply a fine villanelle; it is – not so simple – a fine poem, whatever its shape. There are at least a dozen sonnets in this collection, another villanelle nearly as fine as the one cited above, two sestinas (and two tritinas, which are abbreviated sestinas) – one needs a book of forms to list them all. Ponsot is one of that group of poets born between 1920 and 1930 which seems unmatched in its contribution to American letters; Adrienne Rich, Denise Levertov, Hayden Carruth, Richard Wilbur, Carolyn Kizer, are only a handful of the names we all recognize. She has been writing since she was a girl. So why is her name only now coming into the general consciousness? Raising seven children, mostly on her own, explains part of it; and a long career of teaching at Queens College, where she collaborated on several respected books on how to teach writing, receiving the prestigious Shaughnessy Medal from the MLA for her achievements. Program notes by Samuel Green on behalf of the poet’s reading for Counterbalance Poetry on Tuesday, March 6, 2001. "What the Worn Rhymes Found"
Broadside created by Paul Hunter/Wood Works Press for the poet’s reading for Counterbalance Poetry on Tuesday, March 6, 2001. Printed from hand-set metal type on archival paper with original woodcut. Limited to 150 copies.